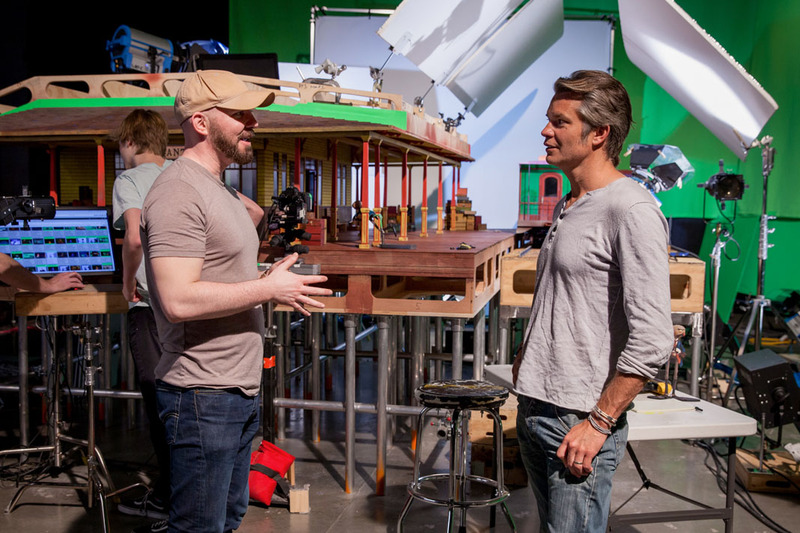 There is no denying that a lot of work goes into creating stop-motion animated films. Just the shooting process alone for a feature-length film can take up to one or two years as a whole team of immensely driven and hard working people come together to painstakingly capture each individual frame. But what exactly goes into the planning and preparation process prior to shooting? Because it’s not like beautifully crafted and clothed puppets and sets appear out of thin air. 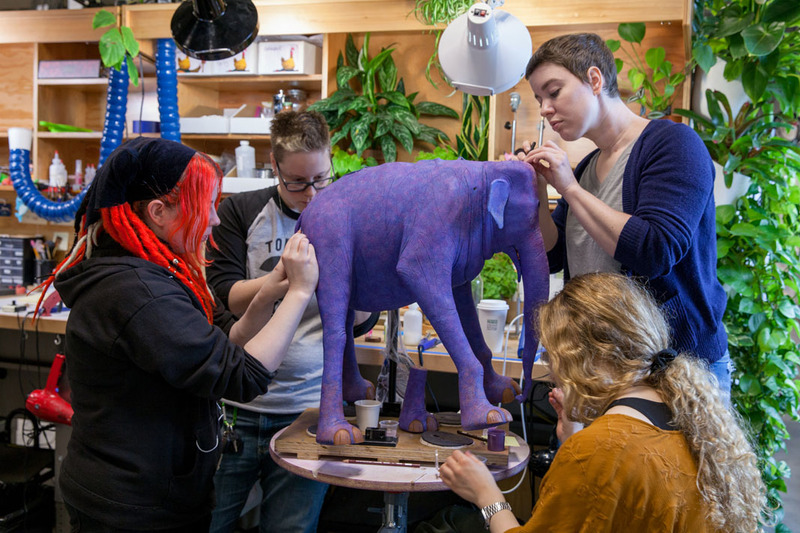 Luckily for us at Vital Thrills, we got a chance to learn all about how each department at LAIKA crafted the characters and sets we will see in their upcoming animated film, Missing Link. The film follows Mr. Link (Zach Galifianakis), a Pacific Northwest creature who is lonely and tired of living in solitude. He takes it upon himself to reach out to Sir Lionel Frost (Hugh Jackman), a fearless explorer who is hellbent on locating mysterious creatures all over the world much to the disdain of high London’s society. He tasks Sir Lionel to help guide him on a journey to find what he hopes to be his family in the Himalayan mountains, where tales are told of a different sort of beast living in Shangri-La. With the additional help of adventurer Adelina Fortnight (Zoe Saldana), the trio travels all across the world and faces all sorts of obstacles on their quest. What follows is a fun, rollercoaster ride of an adventure that is meant to teach all that family can be found in the most unexpected of places. Because the film took place in many different locations, the production department had to do a lot of extensive planning on how best to capture all the various locations that are featured in Missing Link without absolutely killing themselves. Typically, in a stop-motion animated film, there are locations that are frequently returned to throughout the course of the story. This creates a slightly less stressful production design situation. However, for Missing Link, this was not the case and, as production designer Nelson Lowry explained to us, it became imperative to find ways to capture the concept of the film without causing further stress onto the department. One of the easiest ways to do this was to rely on the character designs that director and writer Chris Butler drafted up. These designs of Butler’s would also end up impacting how Brian McLean, the director of rapid prototyping at LAIKA, approached creating the many facial expressions of the very expressive new characters featured in Missing Link. After being given the character designs to try to create for the puppets, there were some facial features that the current 3D printing technology LAIKA had on hand could not accomplish. 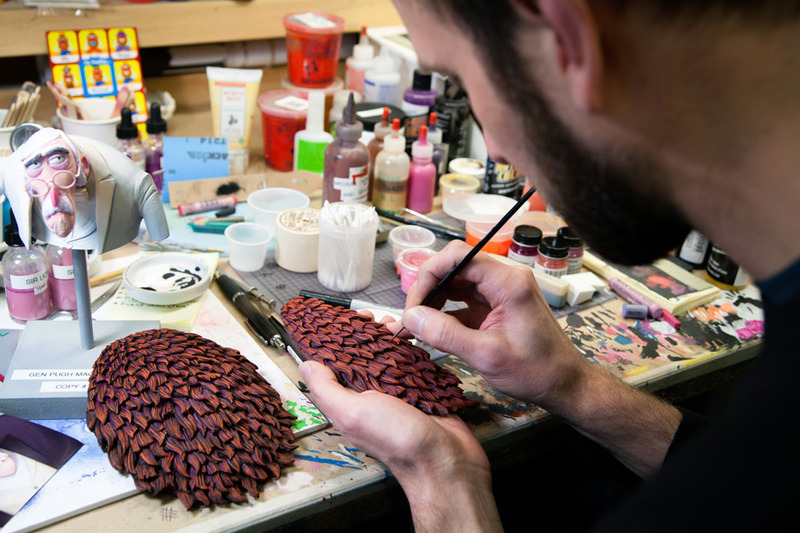 The 3D printer used on ParaNorman, The Boxtrolls, and Kubo and the Two Strings would print out the faces in a powder, which made it very soft and difficult to handle. It was very prone to breakage. Depending on the features that the characters had, a person had to handle the faces with care after the 3D printer was done. However, upon receiving the designs from Butler for Missing Link, McLean acknowledged that there was a need to innovate in order to achieve the look that they wanted on the film. The relationship the LAIKA rapid prototyping team had built with the company Stratasys from using their 3D printers over the years provided them with the amazing opportunity to experiment and beta testing printers before Stratasys released them to the public. Through a period of trial and error and negotiating with Stratasys to find what might suit LAIKA’s needs best, the team was able to negotiate using the hardware from Stratasys and combine software technology from a research facility in Germany to better arrive at the product they needed to get to where they wanted for this project. From what we discovered, the product has been a success, resulting in the rapid prototyping team’s ability to print over 106,000 different facial expressions for the Missing Link production. While Chris Butler’s designs kept the set design team and the rapid prototyping design occupied, Deborah Cook’s fashion department also had to find ways to capture the Edwardian feel of the time period Missing Link was set in with each character’s individual personality and body type. Cook broke down for us during our tour the various type of stitching styles and textiles utilized during the Edwardian era like macrame and quilting, which was surprisingly used for things like crinolines and underskirts. With the fashions rapidly changing during this time period, Cook had plenty to work with. But there was also the matter of finding out what fabrics and textures would look good on screen as well. In the case of Sir Lionel’s suit, there was quite a bit of work to be done. She explained: “We [worked] with a weaver to work out what shapes we could do to create the houndstooth that we wanted for Lionel that would give him this pinched, city look that would look very much in high contrast to the environments he was going to be in, so you would always see his history and his character and where’s he from would be very clear across the whole film. So, the colors are very important in this.” With copious amounts of color tests to ensure that one color didn’t pop out more than the other and fabric tests to make sure nothing was too reflective or buckled too much onscreen, the fashion team landed on stretchy fabrics to capture the suit in all of its glory while also taking into account the wild poses that the puppets would be placed in. Then there was the matter of figuring out how best to accommodate Mr. Link’s heavy, avocado shaped body in the costume department. During the film, Link ends up stealing a suit in order to best fit into the environment around him. However, if one were just using a regular old sewing machine, the end results would not be as successful. Luckily, for Cook and her team, they had access to digital machines that would enable them to design a suit that would best accommodate Mr. Link’s curves and swerves while also maintaining the integrity of the suit’s pattern design. While Chris Butler’s designs presented each individual department with their own challenges to overcome, each was able to find ways to tackle the most problematic parts and bring them to life. 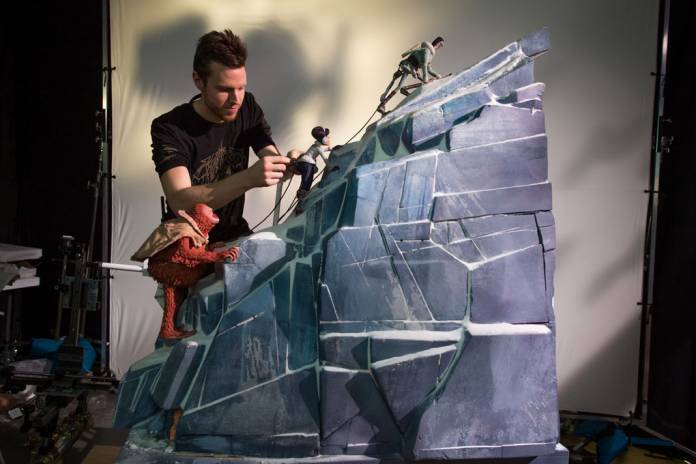 Whether trying to figure out ways to bring 60 locations to life in a reasonable enough time frame on screen, figuring out how to sculpt the smaller features of the brand new characters, or accommodating the clothing choices of giant avocado puppet bodies, the team at LAIKA was able to bring everything to life in beautiful fashion. And, as this writer can testify to, the end results speak for themselves. United Artists Releasing will bring Missing Link to theaters nationwide on April 12, 2019. Sarah is a freelance writer and self-described workaholic. She loves fantasy and sci fi and will admit having dual loyalties between Star Trek and Star Wars as well as Marvel and DC. When she's not being socially awkward, she is in a corner obsessing over dragons, cute things, and a need to master all languages on the planet. She would like to be a professional blanket burrito when she reaches the peak of maturation.